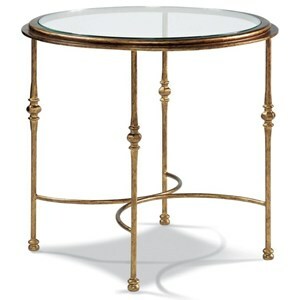 Your living space will take on a beautiful traditional atmosphere with this cocktail table. 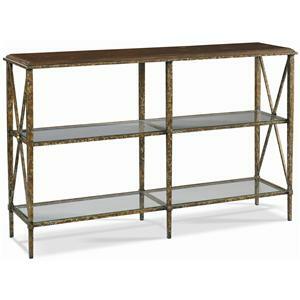 The piece features a glass top and mid-shelf, while the frame itself is constructed of wrought iron in a mottled bronze finish. Further detail can be seen in the shaped lattice-work on each side, as well as in the medallion accents of the feet. 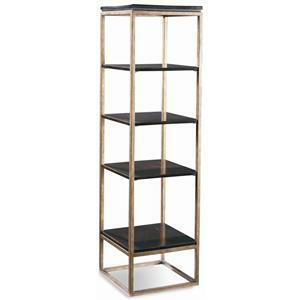 With four open shelves, this entertainment pier makes a sleek open bookcase or works well as a set of two that bookend a media console. The metal base looks fantastic contrasted with the painted shelves. Standard in the -32 Metro finish shown, an additional custom 24 Contemporary finishes are available to create a unique piece for your home. 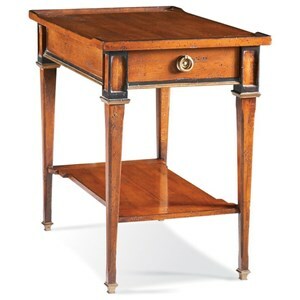 Each piece is handcrafted in America for the upscale quality and design you can count on from CTH Sherrill Occasional. 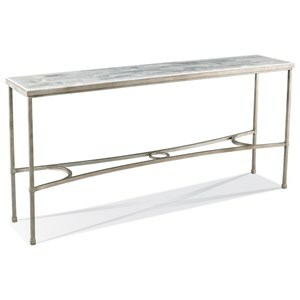 Onyx stone tiles add undeniable beauty to the top of this console table. The simplicity of the iron base in an aged platinum finish completes the chic and versatile design. 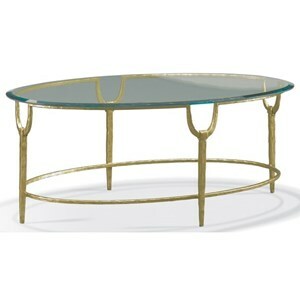 Instantly transform your space into a glamorous sanctuary with this oval cocktail table. The piece features a clean glass surface sitting atop a uniquely designed, hammered texture iron base in either a gold leaf or nickel finish. 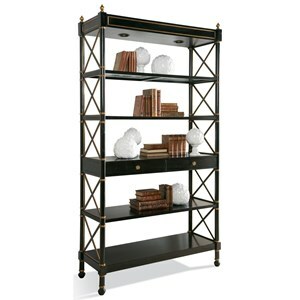 Give your most cherished possessions and books the display they deserve with this beautiful Empire Etagere. The piece is bathed in a bold ebony finish with aged gold accents throughout for a glamorous and subtle art deco look. As storage goes, you receive five spacious shelves and two drawers. The shelf above the drawers is removable, allowing you to fit a television or other large objects. This simple yet exquisitely stylish round end table is sure to have a place in your home. 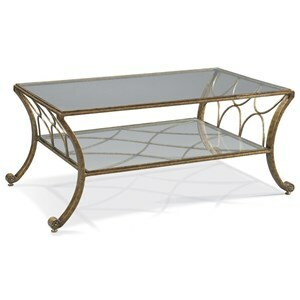 It features a clean glass surface sitting atop a wrought iron base finished in aged brass. 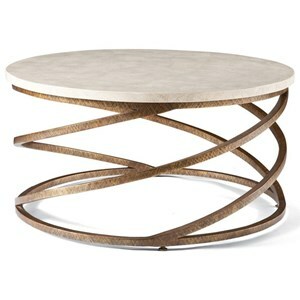 Introduce a fresh take on sophisticated contemporary style into your living space with this round cocktail table. The piece features a cream colored fossil stone top that pairs beautifully with the spiraled wrought iron base finished in a brushed antique gold. 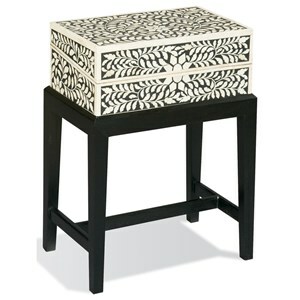 Bone inlaid box on stand with a very stylized all over leaf design. The H-stretcher base is finished in black as is the interior of the removable box. This console table features an artisan crafted wrought iron base with an aged bronze finish and a heavily patterned herringbone patterned walnut top. You will see the attention-to-detail in the wonderful design and construction of this eye-catching console for your living room as a sofa table or for a functional accent in your hallway or foyer. Two spacious open glass shelves provide functional storage and display space to your home. Over 30 years of skill and hand-craftsmanship go into every piece of Sherrill Occasional. Only the finest select hardwoods and veneers are used in the process. And our company process is one of continuous improvement. This ensures that the best methods of providing the most beautiful product and best value are always utilized. Style, Quality, Value, and On-time delivery are core elements in everything we do at Sherrill Occasional. Whether your room calls for wood, metal, glass, marble, stone or a combination of these materials, we've crafted a fine piece of furniture for your personal style. Our craftsmanship adds new depth and texture to your home. Express your traditional, classic or contemporary sensibilities through hundreds of choices designed with individual tastes in mind.